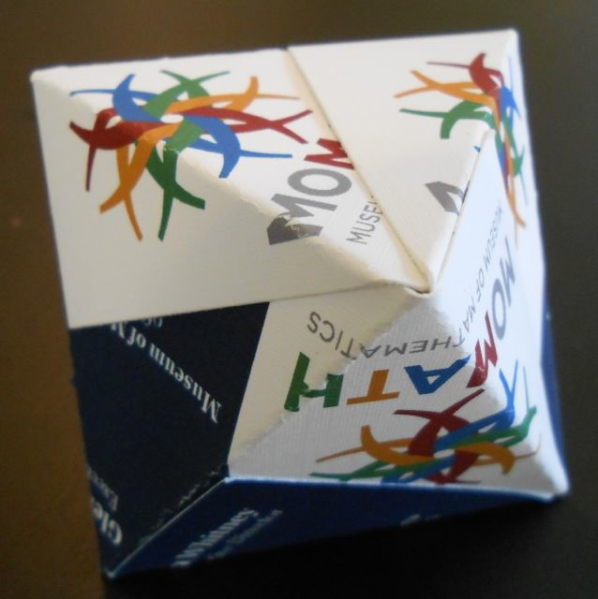 Imagine a regular tetrahedron. 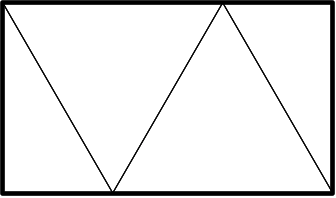 Mark the midpoint of one edge and draw straight lines to the vertices opposite that edge on the two faces incident to that edge. In your mental image, transmogrify that edge and those two lines into zippers and unzip them. What do you get? 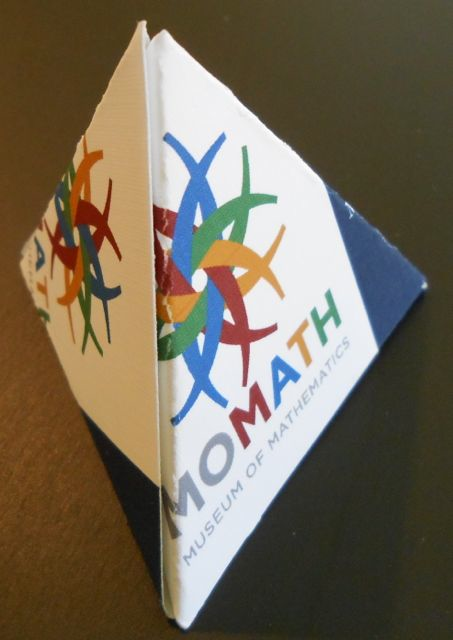 Believe it or not, a standard American-size business card: Or rather, of course, you get a rectangle with a √ 3 :1 aspect ratio, but a business card at 3.5 inches by 2 inches is sufficiently close to that ratio (off by just over 1%) that it’s hard to see the difference. 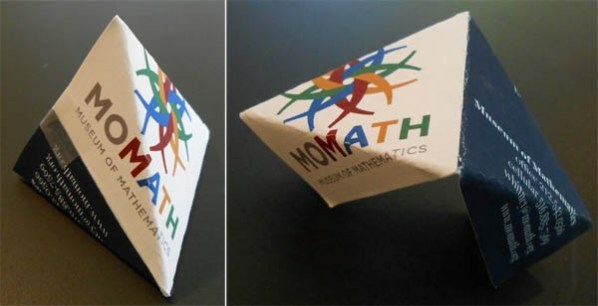 Run that series of steps backwards, and that makes business cards a very handy source of virtually regular tetrahedra to use as building blocks for projects like this design for a three-legged stool: In fact, the fortuitous proximity of the aspect ratio of a business card to √ 3 is the basis for numerous folding and construction tricks. 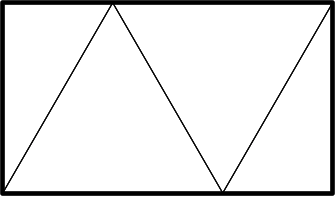 For example, you can bring the lower left corner of a business card to the upper right corner of the card and squeeze the resulting diagonal fold flat. 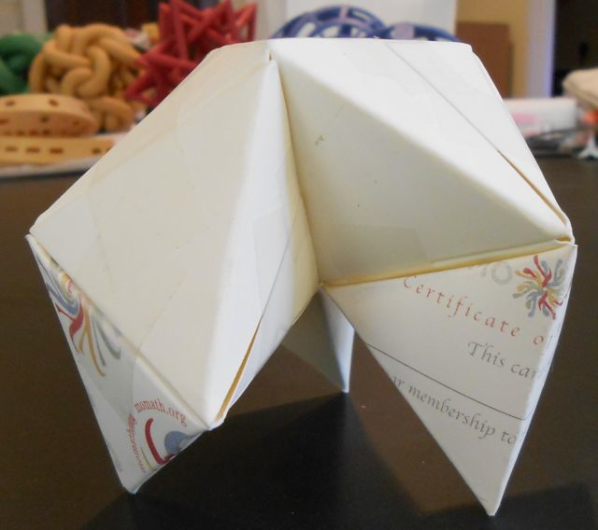 Then fold the two “flaps” that stick out on either side over to produce the following crease pattern, in which all of the creases go the same way: Call that a “right-handed hemitet.” If you start the other way, by bringing the lower right corner of the business card to the upper right corner, you get a “left-handed hemitet,” with the following crease pattern: Slide two of each together with the 30-60-90 right triangular flaps out, and you get a regular octahedron: And one of each will hold together quite well with the flaps in, yielding another, tape-free way to construct the original tetrahedron: Of course, you can build lots of other equilateral-triangle-based constructions out of this module; send a photo to mondays@momath.org if you make something particularly cool. This article first appeared on Make: Online, November 26, 2012.